Sometimes you can’t see it, but you can definitely tell it’s there. Itchy eyes, sneezing, sore throat, congestion—these are all signs of a mold allergy. And if you or your family suffer those symptoms while in your home and you’re not sure why, mold may be the issue. 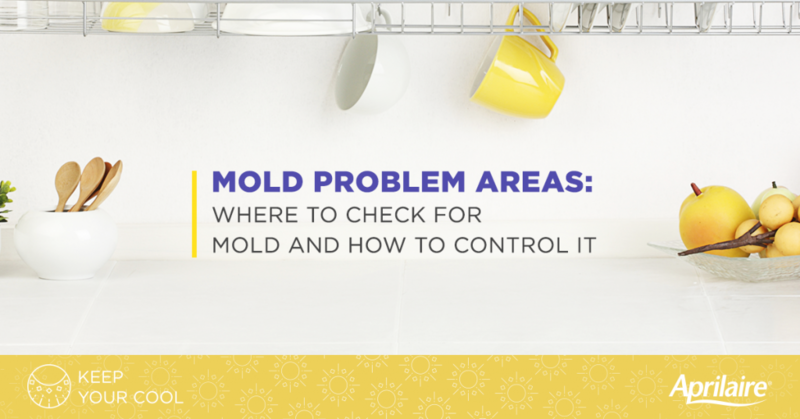 We’ve got a rundown of the most common places for mold to grow, and some simple steps you can take to manage it. Mold can’t grow without moisture, so it’s important to keep all rooms and surfaces of your home clean and at a comfortable humidity level. You want to keep the humidity in your home below 60%. Many dehumidifiers can display the humidity level on their control screen or panel, or you can measure levels with a hygrometer. To control the humidity, invest in a dehumidifier or two. Dehumidifiers are the best way to reduce moisture levels in your home, especially basements or rooms without proper ventilation or windows. You can buy portable dehumidifiers to control moisture in certain rooms, or install a whole-home dehumidifier that handles the air quality throughout your home. Want more info? You can find even more benefits of proper moisture control in our Healthy Home 101 series. You’ll learn why a dehumidifier is good for your home, your energy bill, and your family’s health.